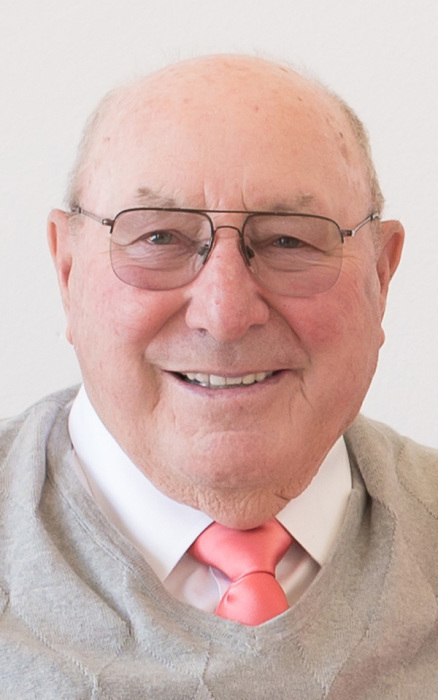 Linden Dennis Beckstead, 89, passed away in Whitney, Idaho on March 20, 2019, just 4 days short of his 90th birthday. He was born on March 24, 1929 in Whitney, Idaho to Alvin Hull Beckstead and Ella Afton Ellis Beckstead. Lin lived his entire life in Whitney and was proud to claim Whitney as his home. He attended school in Whitney and then went to Preston for high school. He met his high school sweetheart, Anne Bennett, during Seminary class at Preston High. Linden and Anne were married on February 28, 1947. They were later sealed in the Logan Temple on June 30, 1966. They celebrated their 70th wedding anniversary in February, 2017 prior to Anne's death in December 26, 2017. After Anne's death, another sweetheart came into his life, Kathleen Douglass. They were married on May 16, 2018. Early in his married life, Lin farmed with his Dad in Whitney for many years. Later he became a dairy cattle trader, working with dairy farmers in the entire intermountain area. He was a part owner of the Smithfield Livestock Auction for many years. In 1975, he also invested in a new bank in Logan, Utah, which later became Cache Valley Bank and in his later years he devoted much time and effort to the banking business. Lin's early church service was with the Explorer Scouts. He later served as a Bishop's Counselor, High Counselor, and Bishop. Lin and Anne served a mission in the Canada Halifax Nova Scotia Mission in 1993-1994 and later served two missions in Salt Lake City on Temple Square, a short term mission at the Hill Cumorah during the pageant in 2000, and a short term mission on Temple Square during the 2002 Winter Olympics. Together they served as ordinance workers in the Logan Temple for many years. Lin had the ability to connect with people. He showed an interest in people and he made friends out of strangers very quickly. He loved his grandchildren and great-grandchildren and had a nickname for almost all of them. They loved to come to Whitney to visit Grandpa and Grandma. He made the grandchildren feel special. Linden is survived by his wife, Kathleen, of Whitney, Idaho and children Sid (Pat) Beckstead, Bountiful, Utah, currently serving a mission in Palmyra, New York; Kelly (Linda) Beckstead, Idaho Falls, Idaho; Scott (Kristen) Beckstead, Preston, Idaho; Jill (Robert) Ferguson, Kaysville, Utah; Jan (Scott) Brenchley, Pocatello, Idaho and step-children, Tracy Lund, Smithfield, Utah; Denise (Kory) Owen, Preston, Idaho; David (Erika) Gittins, Logan, Utah; and Emily (Kurt) Nalder, Lewiston, Utah. He is also survived by 36 grandchildren and 75 great-grandchildren, and 1 great-great-grandson, all of whom he loved dearly. He is preceded in death by his wife, Anne Bennett Beckstead; his parents, Alvin and Afton Beckstead, and his brother, Norman, and sisters, Blanche, Barbara and Carol Jean.